We’ve been taking a look at some of our providers over the past few weeks, as a means of showing the sort of quality you can expect from a Silke package kitchen. Today’s entry will be the last in this little series for the immediate future, because we only have one more company to take a look at; Spekva. 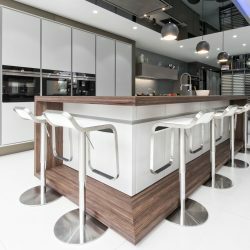 Spekva is a little different from many of the companies we’ve looked at so for, as they specialise not in sleek, metallic appliances, nor quartz-based, cutting edge materials used for worktops; Spekva specialises primarily in wood. Designer wood, if you will. We love the look so much we actually created a huge display in our showroom to provide an insight to the possibilities with this often overlooked “old fashioned” material. Johannes Spek established the brand in 1968, and laid the foundations for a company that would put emphases not only their love of wood as a material, but their dedication to excellent craftsmanship as well, something that has helped the company stay in business for as long as it has, and helped it become one of the leading kitchen worktop manufacturers in Europe; not bad for something that started in a tiny workshop in Vamdrup. As you could’ve guess, though their talents are turned to many things, wooden worktops for kitchens are Spekva’s bread and butter. Although the idea may make a few people wary, Spekva point out on their site that wood does indeed have some advantages; wood is capable of fighting off some bacteria by virtue of the enzymes and tannins within the wood itself, and maintenance regarding minor damage and scratches is as simple as carefully using sandpaper and/or polishing pads, which Spekva provide a set of as standard. That’s covering strictly the technics, however; as much as many of us are taken in by cool metal and bold, high tech design, some of us favour a retro chic that takes you back to simpler, warmer times, and wood is the perfect material to evoke that feeling. Spekva are very aware of this fact, and thus have meticulously tailored a sizeable portion of their design pool to fit within that style, with a range of 17 different styles of wood, ranging from Dark Ash to Mahogany, and three separate design options; Royal, which has the wood placed in a neat, single-line design; Classic, which arranges it in a more complex, brick-like pattern; and Prima, which has the wood mixed together in a diverse, random pattern. All three designs and every type of wood all perfectly capture that golden years aesthetic very nicely, and the paneling can even be applied to appliances if so desired, or use for tabletops. As if that didn’t all already sound pretty fantastic, Spekva offers perhaps one of the best warranty services in the business, one that will cover you for serious damages and faults to your Spekva product for 30 years. We hope you have found these articles informative, and with any luck, they’ve helped convince some of you to shop with us knowing that our kitchens include products and services by all these great companies.